It sounds like a typical love story. Sophia and Maxwell were the best of friends growing up. As High School ends and they prepare to go their separate ways, they make a pact. If neither of them is married by the time they reach 30, they will marry each other. And that’s where “typical” ends. Because what happens next you won’t see coming. 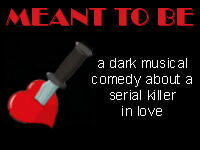 Meant to Be is the latest Joshua Kurtz original musical to be produced by Aftershock. This truly unique piece will have you laughing, crying, cheering and booing, as a serial killer murders his way to the heart of the one he loves. Along the way, he’ll have to deal with cops, the CIA, the mob, and some of the most ridiculous nonsense you can put in a show without bringing in ghosts. On that note, no promises we won’t be bringing in ghosts. Will he succeed? And if he does … will his love share the feelings for him that he has for her? Will they live happily ever after? Or is their love not … Meant to Be? This show contains violence, excessive foul language, and strong suggestive themes. May not be appropriate for children. Children 17 and under should be accompanied by a parent/guardian. If you are coming on Friday night, shore traffic will delay your trip. Please plan accordingly. Pass the next traffic light. The Estate at Monroe is about one mile down on your right. If you get to Geets Diner on the left, you’ve gone about 1-1/2 miles too far. Online ticket sales are closed. Please get your tickets at the door. Share it. Like it. Tweet It. Post it. This entry was posted in Meme. Bookmark the permalink.